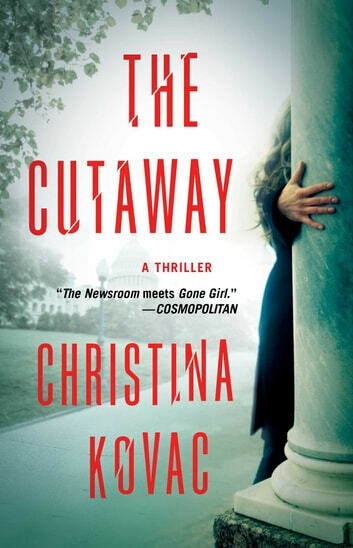 “The Newsroom meets Gone Girl” (Cosmopolitan) in this stunning psychological thriller featuring a young television producer investigating the disappearance of a beautiful Georgetown lawyer—perfect for fans of Paula Hawkins and Gillian Flynn. When brilliant TV news producer Virginia Knightly, “a tenacious, lovable heroine” (Publishers Weekly, starred review), receives a disturbing “MISSING” notice on her desk related to the disappearance of a beautiful young attorney, she can’t help but suspect that the lawyer may be at the heart of something far more sinister. When she realizes that she is the only one at her studio who seems to care, Knightly decides to investigate on her own. Harkening to dark thrillers such as Luckiest Girl Alive and Big Little Lies, The Cutaway is a ravishingly suspenseful thriller. An interesting portrayal of the world of TV News gathering and presenting - a gripping plot! I will never look at the Anchor persons in the same way again knowing the cut throats industry that they are in! I liked this story well enough even if I didn't love it. I think that the newsroom setting was one of the strengths of this book and it did add a rather unique quality to the story. Unfortunately, I was never completely hooked by the story. The mystery was interesting but I just never found myself truly invested in the story. This story is told from the point of view of TV new producer, Virginia. When Virginia sees a missing poster for Evelyn, she knows that she has seen her face before. She remembers Evelyn being in another piece on the news station as a cutaway shot and she is drawn to her story. As Viriginia works to find out what happened to Evelyn, she soon realizes that the case may be much bigger than she originally thought. This book actually had a whole lot going on. Probably too much if I am being honest. While Viriginia was working on this case, it seemed that her whole world was falling down around her. There is a big shake-up at the news station that makes everything tense. Virginia's personal life is also a major focus with past relationships, new relationships, and family making an appearance. These topics were interesting but it seemed to change the focus from the mystery so often that I had a hard time keeping track of everything and I don't think that it always added a lot to the overall story. The overall mystery was rather complex. This book did take a lot of twists and turns that I didn't see coming but there was nothing that was truly unexpected. I thought that the mystery did make sense in the end. As the mystery really started to unfold, the excitement levels increased. I did enjoy the newsroom perspective and thought this felt rather authentic. This is a book that I am glad that I read and I think that mystery readers will enjoy the newsroom point of view. I thought that this was a solid debut novel from Christina Kovac and I look forward to reading more from her in the future. I received an advance reader edition of this book from Atria Books - 37 Ink via NetGalley. An excellent read, had trouble putting it down. Well versed in Politics of course and a great thriller. I would recommend this read to anyone. Thanks Christina. It was ok not what I expected. It was interesting but slow reading. It was not a fast paced page turner. Stayed up till the wee hours because I had to keep reading to find out what happened next. An excellent thriller. Loved the way the story unfolded. Not one of your usual. Would recommend to everyone who likes vets a good book without the usual graphic love scenes or violence. The main character is a girl after my own heart. She looks after herself first.